Late At The Library | Livestream Felabration Performances tonight! 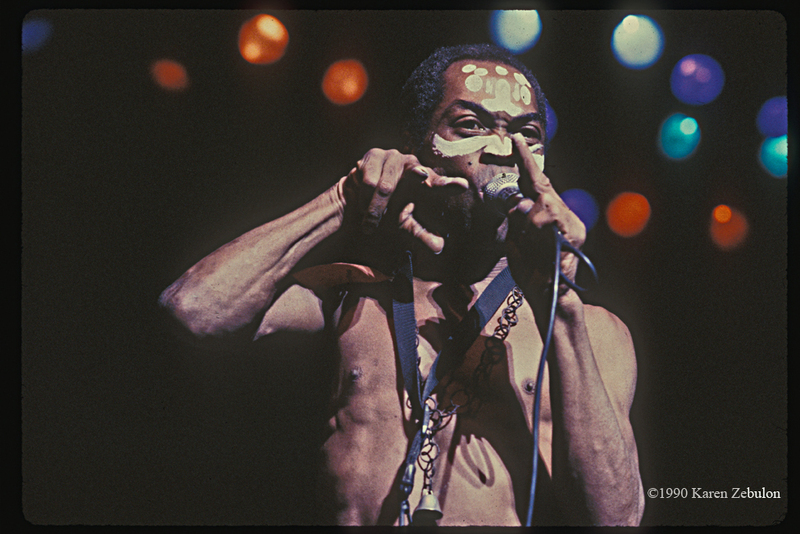 The British Library is celebrating Fela Kuti’s 77th birthday with a really impressive line up. Felabration marks the birthday of Fela Anikulapo Kuti (1938-1997), the defining creator of the funk, jazz and rhythmic force that is afrobeat, which emerged in Nigeria in the 1970s. As well as a composer and multi-instrumentalist genius, Fela was a human rights activist and defiant political and social maverick who’s influence continues to reverberate throughout Africa and beyond. This supercharged tribute to the man and his music is led by Dele Sosimi and his 16-piece Afrobeat Orchestra. Dele Sosimi played keyboards as part of Fela’s Egypt 80 band from 1979 to 1986 and created Positive Force band with Femi Kuti with whom he performed from 1986 to 1994. Very special guest on the night will be legendary drummer Tony Allen, who played with Fela from the early 1960s. They created Afrobeat together and many of the greatest recordings of the 1970s with the Africa’70 band. He remains a sought after drummer worldwide for electronica, jazz and rock projects; including Damon Albarn’s The Good, the Bad & the Queen. Also taking part, direct from Lagos, will be 2Face Idibia, the multi-million selling recording artist and producer who rose to fame as part of R&B/hip hop group Plantashun Boyz, and has gone on to even greater solo success with Afrikan Queen and many other hits. Further brilliant guest vocalists include Laura Mvula, Shingai Shoniwa (Noisettes), Afrikan Boy, Bumi Thomas, Ed Keazor, Terri Walker, Audrey Gbaguidi and The Floacist (Floesis). Plus DJ Koichi and The Trinity College Afrobeat Ensemble.